It is known that the luminescent centers Eu2+ (1.24–1.40 Å), Ce3+ (0.88–1.02 Å), Nd3+ (0.99–1.15 Å), Tb3+ (0.89–1.09 Å), Ag+ (1.13–1.26 Å), Sn2+ (0.93 Å) substitute for Ba2+ (1.35–1.44 Å) or Sr2+ (1.10–1.27 Å), which are in 12-fold coordination in the barite structure (GOROBETS, 2002; GAFT et al., 2005; all ionic radii are for the 6-coordination form). A possible accommodation for the established in this study Eu3+ (0.97–1.13 Å) is also isomorphic substitution for Ba2+ or Sr2+. 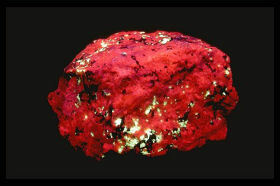 The presence of uranyl molecules in barite is considered to be a result of chemical adsorption (GOROBETS, 2002). 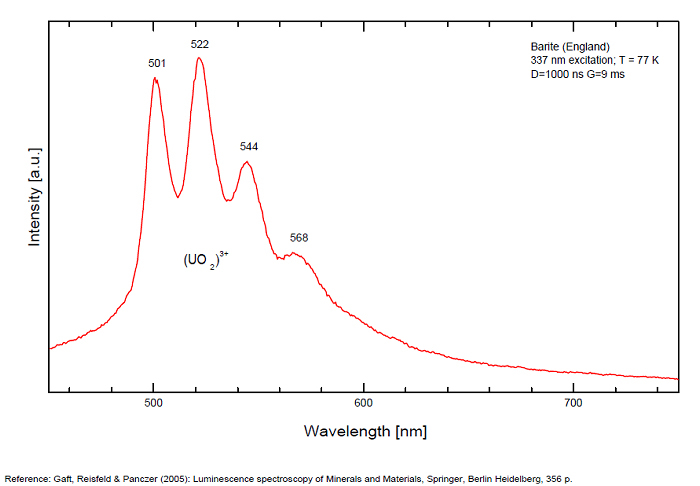 UO22+ can be determined from the vibrational structure and the long decay time of the luminescence band. Two different types of uranyl could be detected in Baryte: thin films of uranyl mineral and a solid solution of uranyl ion in barite crystal. 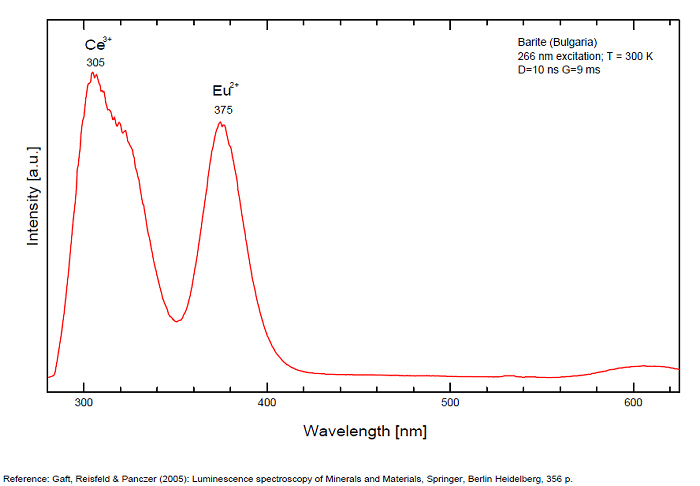 Eu2+ can be determined from the spectral position, the half-width and the characteristic decay time of the luminescence band. 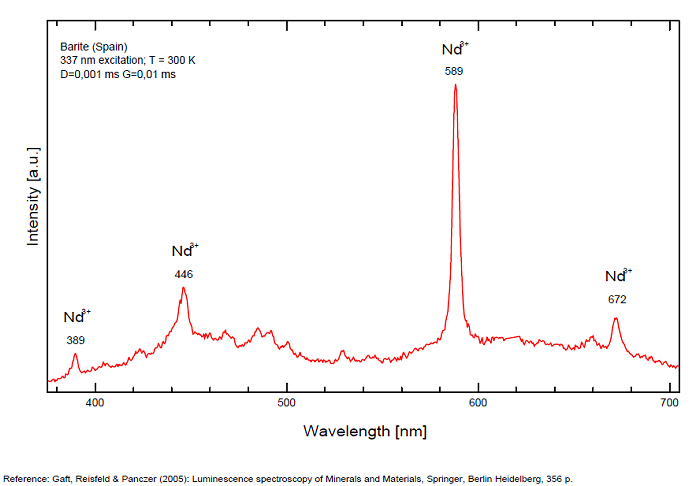 Mn2+ and Ag+ can be determined by comparing luminescence bands spectral parameters to those of synthesized BaSO4−Mn and BaSO4−Ag. In natural barite the narrow orange band with λmax=625 nm, Δ=40 nm and τ=5 μs is connected with Bi2+ center. The narrow violet band with λmax=625 nm, Δ=35 nm and τ=1.7 ms is connected with Bi3+ center. 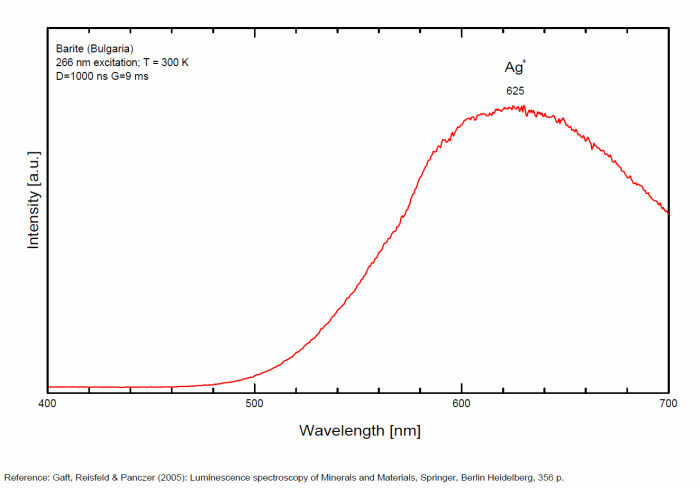 The luminescence spectrum (excitation of 266 nm, without delay, broad gate of 9 ms) of the studied endogene barite contains 2 relatively narrow ultraviolet bands: one peaking at 306 nm and the other at 375 nm. The first band has a very short decay time and disappears after D = 50–100 ns. Such a combination of spectrum and decay time parameters is evidence that the luminescence is connected with Ce3+. The emission of Ce3+ corresponds to transitions between 5d1 and 4f1 electronic configurations. The second band has a longer decay time of approximately 1 μs and belongs to Eu2+ (GAFT et al., 2005). The Emission spectra of Eu2+ result from electronic transitions between 4f7 and 4f65d1 electronic configurations. After a delay of several μs, the Eu2+ emission becomes much weaker and very weak narrow lines appear, peaking at 488, 544 and 615 nm ). These lines are connected with trivalent rare-earth elements, which are characterized by relatively long decay times of hundreds of μs: the first 2 lines certainly belong to Tb3+ and the last one is principally typical for Eu3+ (GAFT et al., 2005). 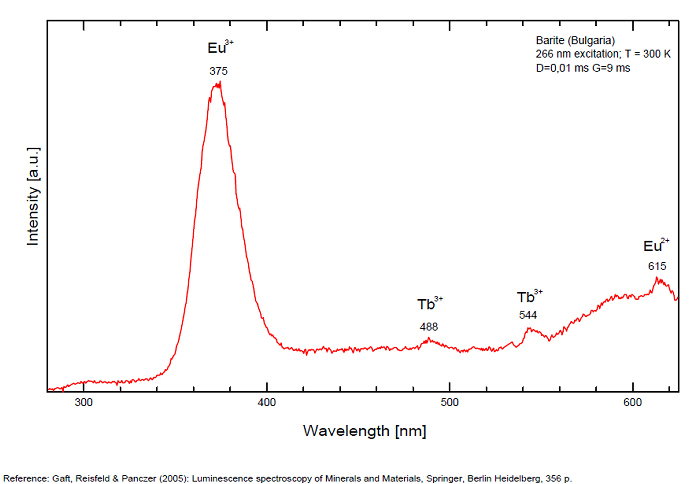 While Eu2+ luminescence is common, Eu3+ emission is here detected for the first time in barite. Under excitation of 532 nm, a luminescence line at 615 nm dominates the spectrum, accompanied by several lines near 700 nm. Such a behavior confirms that Eu3+ is responsible for these luminescence lines. The emission of Eu3+ corresponds to f–f transitions – from the excited 5D0 level to the 7Fj (j=0, 1, 2, 3, 4, 5, 6) levels of the 4f6 configuration.